Our pumps are designed to API610 10th edition specifications specifically for the Petrochemical and Oil & Gas markets. These heavy-duty process pumps are horizontal, radially split and constructed to a modular design, making them easily adapted to match your site standard. All API materials are available as standard plus bespoke options (including NACE compliant materials) which are available on request. 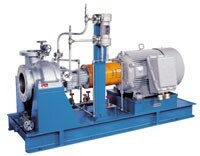 The pumps incorporate proprietary components from all the major manufacturers and unit lead times are very competitive. A full range of customer specific documentation, testing and NDT options are offered to compliment the product.